Many cooks throw steaks on a hot grill or over a hot fire and once it reaches the right temperature in the middle, it's done. What if I told you there was a better way and one that some steakhouses even employ to produce a perfect edge-to-edge pink medium rare with an elegant sear on the outside? 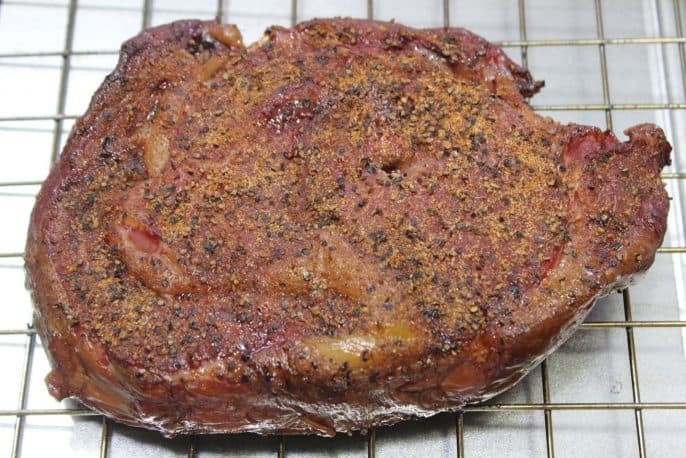 This recipe will show you how to dry brine, smoke cook, rest and then reverse sear a smoked ribeye steak that is better than anything you can get at any restaurant. 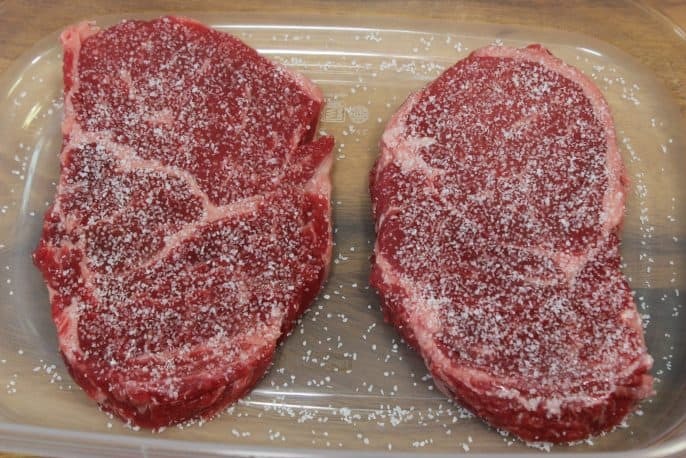 Lay the steaks on a plate or open container and sprinkle kosher salt on them. Be generous but don't go overboard. Typically ½ teaspoon of kosher salt per pound of meat is what the experts recommend. 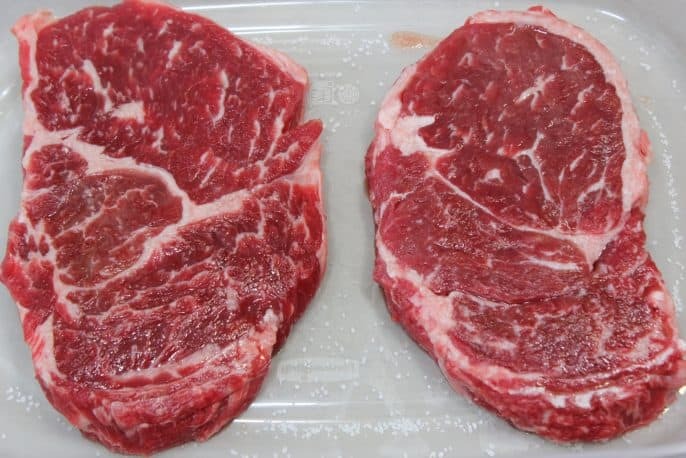 For ¾ inch steaks like these, I just coat one side. For thicker steaks, I recommend brining both sides– one side at a time for 2 hours each side. You then place them in the fridge uncovered. The salt immediately begins to pull the juices to the surface where it mixes with the salt and becomes a slurry. Over the course of time, the salty meat juices are drawn back into the steak and if you wait long enough it will absorb deep into the meat. The thicker the steak, the longer they need to sit in the fridge. I left these ¾ inch steaks for about 2 hours and they were perfect. Rinse the steaks when they are finished to make sure there's no salt residue on the outside. 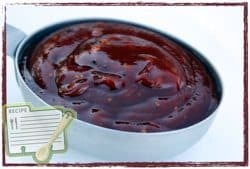 Some folks might just add a little pepper at this point since they salt is already seasoning the inside but I highly recommend my Texas style rub (purchase recipes here) on these. 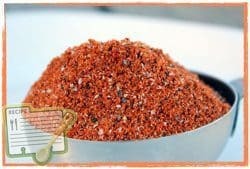 It's pretty low in salt and has some other things like cayenne and garlic to really ramp up the flavor. The Texas style rub makes beef really, really happy! 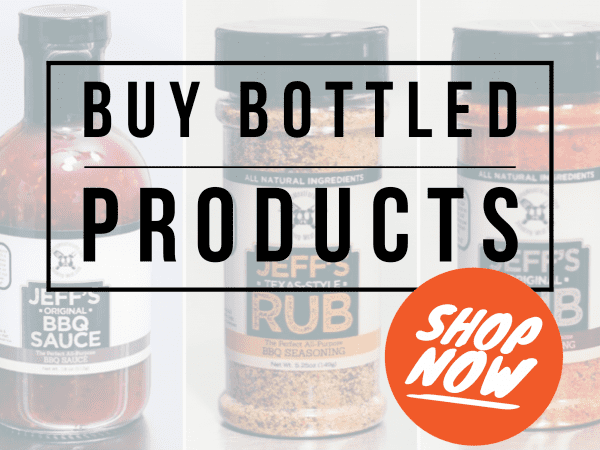 Both sides should be seasoned with the Jeff's Texas style rub (purchase recipes here). Leave the steaks sitting on the cabinet for a few minutes while you go get the smoker set up. They need to warm up a little bit anyway after being in the fridge for several hours. 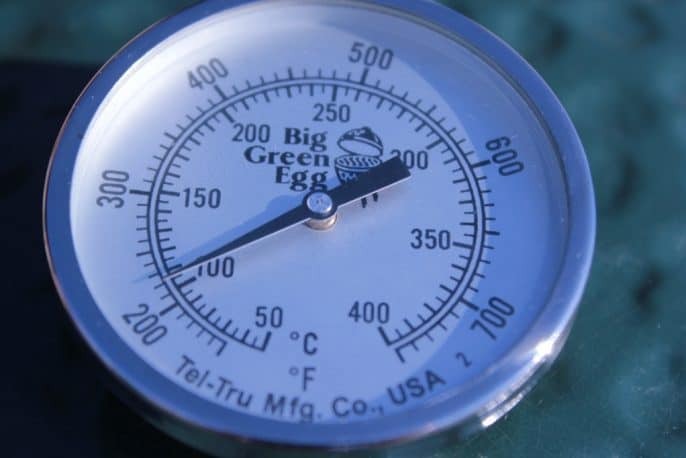 Set up your smoker for cooking at about 225°F if possible. 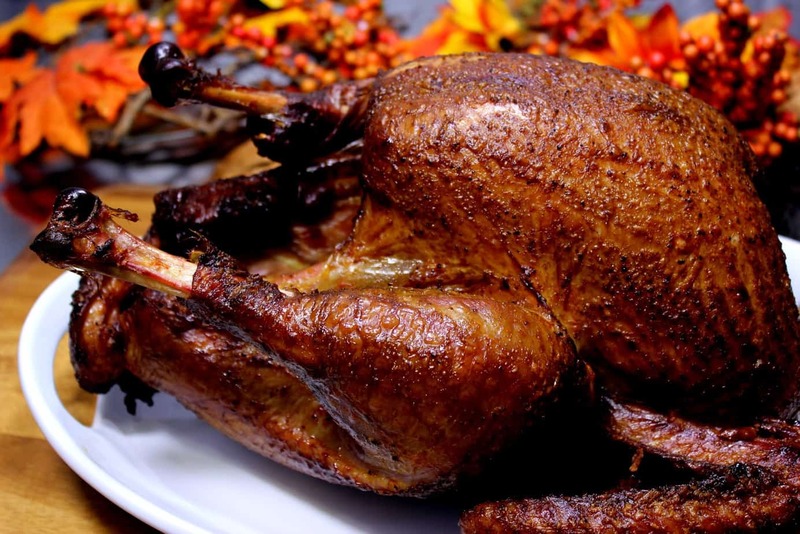 Use indirect heat and if your smoker uses a water pan, fill it up. 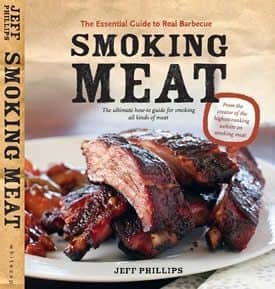 The smoke can be any good smoking wood but I recommend cherry if you have it. Other great woods for these are pecan and oak. Once the smoker is ready, place the steaks on the smoker grate. You can also use a Bradley rack or Weber grill pan to make it easy to transport the ribeyes to and from the smoker. For electric, gas and charcoal smokers, keep a light wood smoke going for at least an hour but more is ok as long as you have plenty of airflow into and out of your smoker. 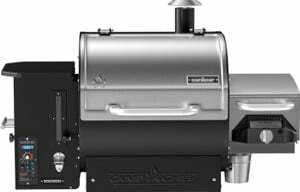 Wood smokers will continue smoking the entire time by default. 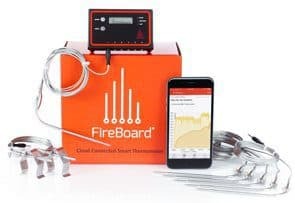 Be sure to use a digital probe meat thermometer such as a Thermapen or the “Smoke” by ThermoWorks so you'll know the very second when the steak gets done so you can remove it from the heat. I recommend letting it go to about 120°F since we are going to sear them later and the carryover heat plus the searing should bring it on up to a perfect medium rare. Once the ribeyes reach the set temperature, move it from the heat immediately. Let the steak rest away from the heat, tented with foil for about 10 minutes to allow the juices to return to center. Place a cast iron skillet over a high heat burner. Use a little vegetable oil in the center of the pan and get it super hot. Once the pan is ready, place the steak in the pan and rotate the steak with your tongs to spread the oil around a little. About a minute each side should do it but keep a close eye on it. You'll see lots of smoke and this is how it should be. If you have a side burner on the grill, that is a better choice than using a burner in the house. If you must use the burner in the kitchen oven, just make sure to turn the exhaust hood fan on and perhaps open a couple of windows during this process. You can also use a screaming hot fire to do this but it's a little less predictable and requires more finesse to get the job done right.. your choice. Once again, let the steaks rest (no foil tented over them this time) for about 5 minutes and then serve them to your guests with ample sides. How to dry brine and reverse sear smoked ribeye steaks. This gives you perfect edge-to-edge medium rare with the most beautiful seared outside you've ever seen. 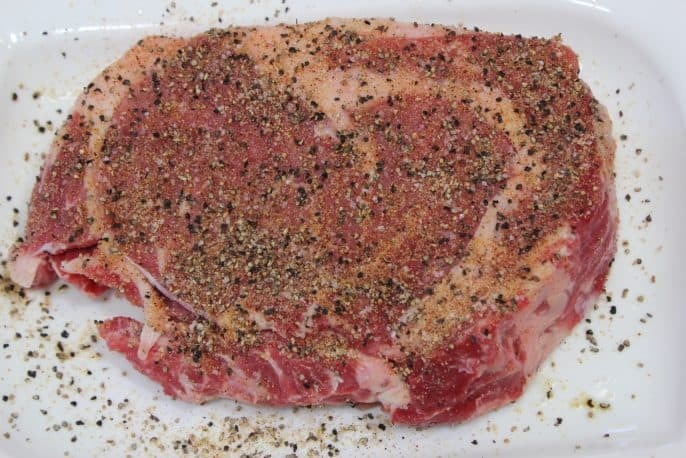 Dry brine the steaks by sprinkling about 1 tsp of kosher salt on the top. If they are extra thick, do the bottom as well. Place the steaks on a plate or open container in the fridge for 2-4 hours. The thicker the steak, the longer it takes. When the brining is complete, rinse the steaks and set aside. Season the steaks, top and bottom with Jeff's Texas style rub and let them come to room temperature while you get the smoker ready. Prepare the smoker for cooking at 225°F with indirect heat and cherry wood for smoke. 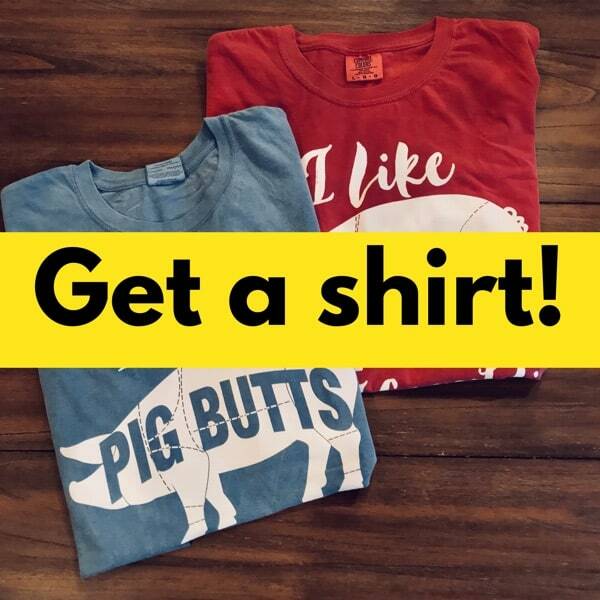 Pecan or oak are also great choices. 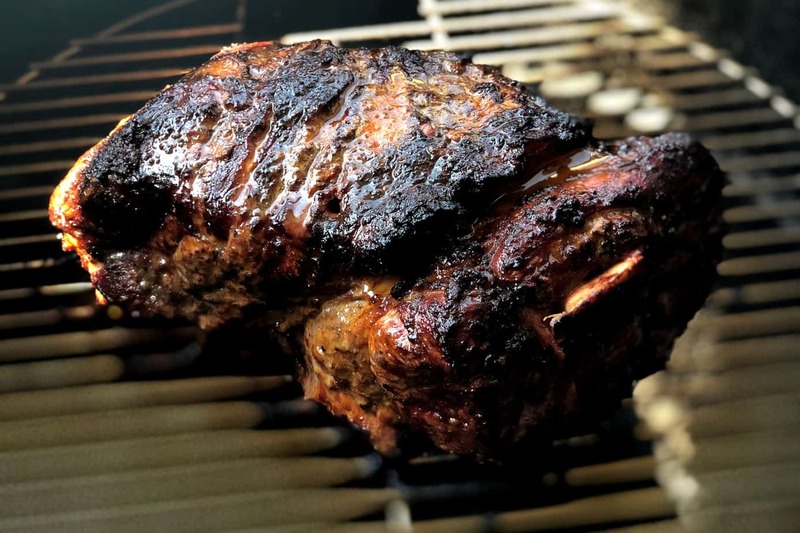 Place the steaks on the smoker grate for about 1.5 to 2 hours or until they reach 120°F in the center as measured by an accurate digital thermometer. Remove the steaks from the heat and let them rest with foil tented over them for about 10 minutes. 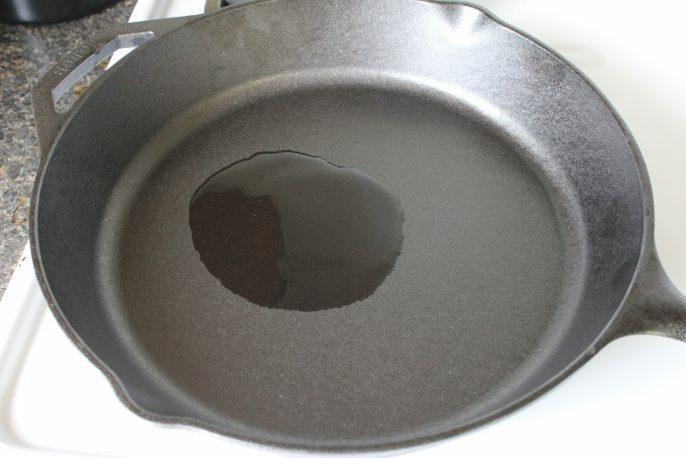 Meantime, heat an iron skillet over high heat and once water will spit in the pan, it is ready to use. Pour a little vegetable oil in the center and place the steak in the pan rotating it to spread the oil out. Sear each side for about a minute. Let the steaks rest for about 5 minutes, no foil this time and then serve to your guests. I love this recipe!!! I did the dry bribe and I have a Masterbuilt electric smoker so I used grape juice in my water pan. I used 1 inch thick ribeye steaks and Jeff’sTexas Rub recipe. I used cherry wood and kept my smoker at 225F. I like my steaks medium well, so I brought mine to a temperature of 139F when I removed them from the smoker. I also finished them off in my cast iron skillet and topped with a Texas Rub butter I made from 2 tablespoons of butter mashed up with 1 teaspoon of Jeff’s Texas Rub. The steak was very tender and juicy. My steaks smoked in 35 minutes and I used an internal meat probe when smoking to time my meat. Next time I’m going to try 2 inch think ribeyes so I can get a bit more smoke flavor in them but excellent recipe!!! 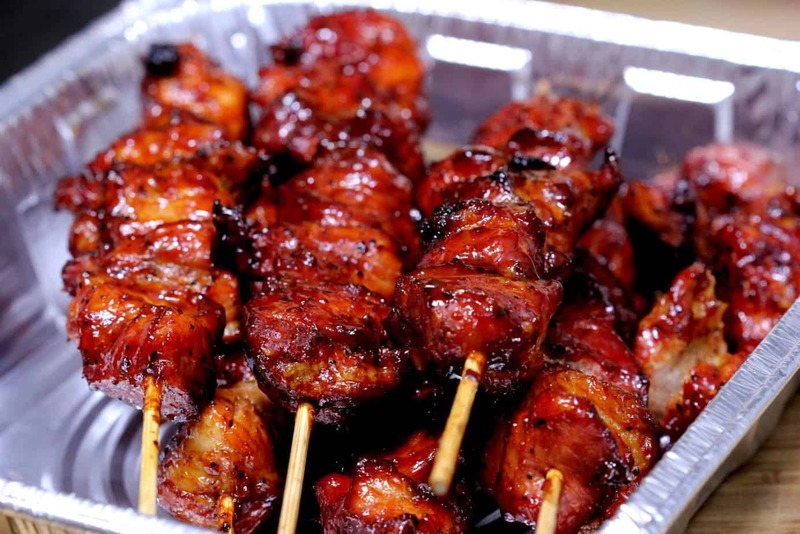 I started using this recipe exactly as Jeff outlined it, to unbelievable success. I’ve done it 3 or 4 times now, and my family and guests have been blown away at how good it is! 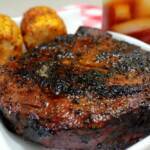 The reverse sear makes the “crispy” bits on the outside of the steak really stand out. 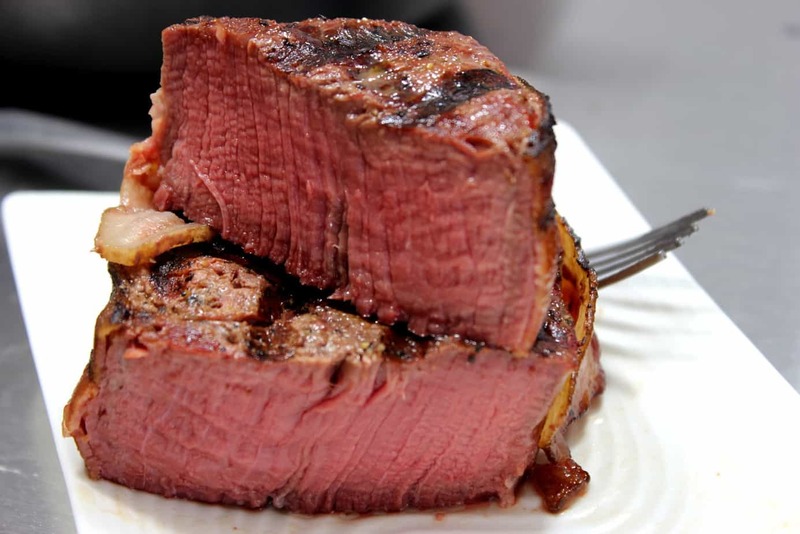 Think of the best steak you’ve had at a big name steakhouse (Morton’s, McCormick & Schmick) and you’ve got the idea. I’ve done it on 1-1/4″ thick Ribeyes, and 2-1/4″ Ribeyes. 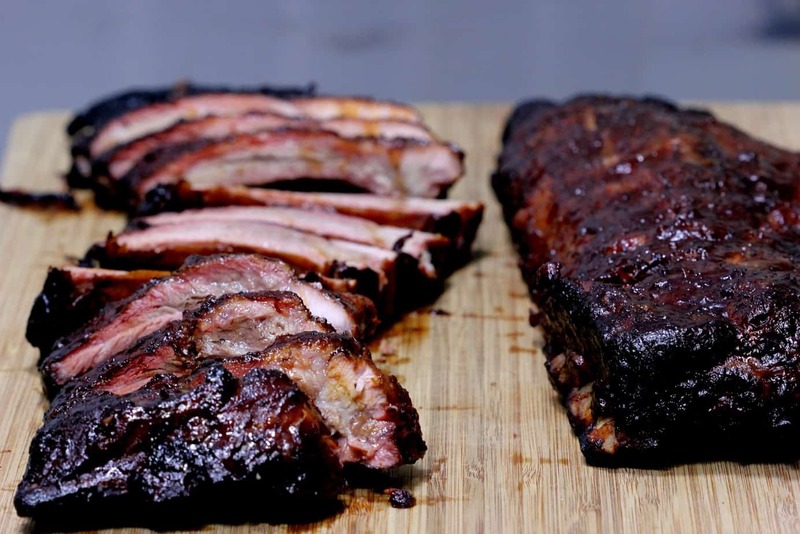 I used my Thermapen and got them to 110 degrees in the smoker, and yes, they got there a little quicker than I expected (that may be because I let them sit out for about an hour before putting them in the smoker). Throw ’em in that super hot frying pan, and voila! Don’t be afraid of it. Go for it! and…… Thanks Jeff! I’ve been doing this for a while. Except, I don’t use the smoker, I use a camp file with the grill about 3 ft above so it takes at least 45 min to get to 105 deg. Then rest the steaks while we get the fire hotter and even. lower grill down to the fire and do the sear until 125 deg. Awsome ! I use steaks at least 1-1/2 inch thick, dry brined cold steak for an hour or two at room temp, good coat of pepper and garlic. Beats even the best steak house if you use prime or better. Not bad with choice if you get the best marble the butcher has. And we especially like Brad’s tip to use cheaper ribeye “select” cuts, we’re going to have to try that! I just followed this recipe this weekend. Holy crap, it was no lie the best result of anything I’ve ever smoked. So freaking tender. We did a taste test. The ribeye select had the best flavor. Next party we can save a lot of money using this recipe and the “select” cut of ribeye. It has been three days and I ready to do it again. I prepared this steak recipe for just my wife and me, and without a doubt, it was the best steak we ever had -, bar none! My son came over for dinner on Sunday and he doesn’t like smoke on his steak so I cooked the steaks per the recipe, just no smoke. The steaks were fantastic, better than any I have ever had at a restaurant, including Texas Road House! 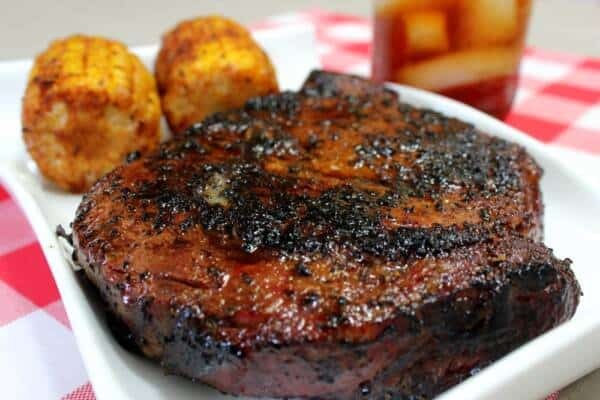 The smoke adds another layer of flavor but it is not necessary to produce a fantastic steak using this recipe. Either one will produce a steak that is pink yet firm from the top to the bottom. Thank You!!! 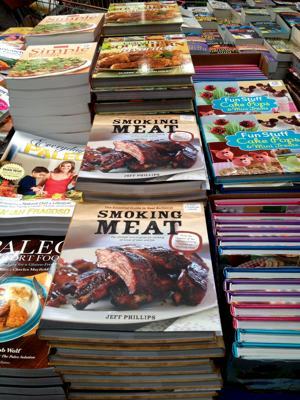 Hi Jeff, love your smoking wisdom and your advice – have your books and rubs – but I am completely stymied by this recipe. I picked up seven bone-in rib eye steaks at the butcher (1 and 1/4 ” thick, over a pound each). 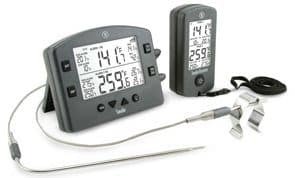 I dry brined them, per instructions, used your rub, and put them in a Weber smoker with water basin at 225, with cherry wood – and fitted them with remote thermometers. They hit 120 degrees within 20 minutes! 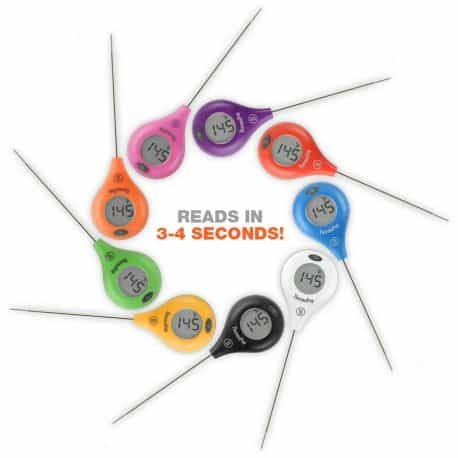 This was confirmed by the Thermapen – 120+ degrees in all steaks, at all locations, in that short amount of time. I had planned for 1.5 to 2 hours, as per your instructions, so I was surprised to see this outcome! I’ve wrapped them tightly in foil, in a warm oven, waiting to catch up with the rest of dinner so I can put a sear on them when the guests arrive. What did I do wrong? I had the exact same experience, except they still turned out fantastic. Not sure why they got up to temp so quick. 4 stars only because the time seems really off. This may be one of the best things I have ever eaten! I left the salt out of the rub because of the dry curing; good idea. They were done before I was ready but sat and rested for a half hour or so before I put them on the searing station of my grille. AWESOME!